This table is perfect for almost any situation and has a timeless style. Featuring tapered legs that add a lightness and elegance to the piece, it has a noticeable presence yet is able to blend in pleasantly with with the rest of the room. 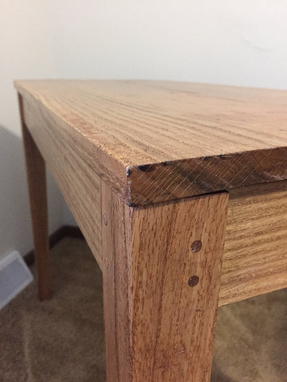 This table is shipped in a flat-pack to save on shipping cost. Assembly is a breeze requiring only a mallet and screwdriver, but when assembled, it's perfectly sturdy and won't work loose over time. This is a customizable table (size, wood type, etc.) so please contact me before purchase with any changes. The table pictured and priced is 17" wide 30" long and 28" tall.